A basic recipe can be transformed into something special by adding some of your homemade preserves. 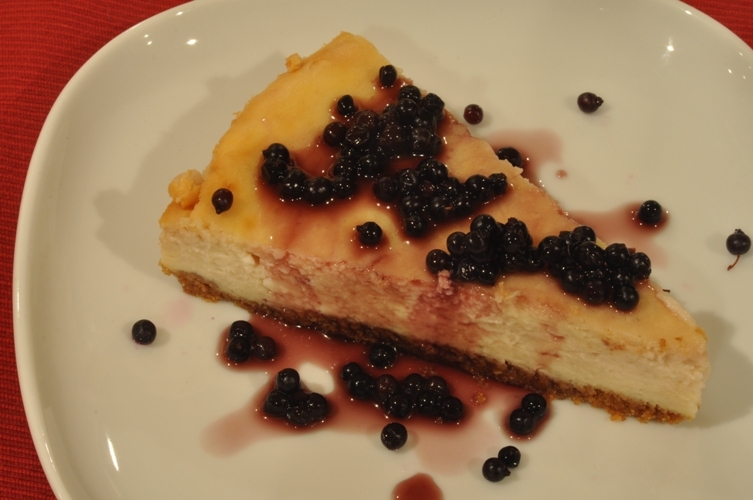 Here we take a simple cheesecake recipe and subtly flavour it by adding a splash of homemade elderberry maple syrup, toss on a few elderberries to dress up the final plate and voilà! It’s as easy as 1, 2, 3 but looks and tastes like you slaved on it for hours. The hardest part is waiting for it to cool. Combine graham cracker crumbs and melted butter in a mixing bowl. Place in the bottom of a springform pan. Press to flatten. Place cream cheese in a microwave proof bowl and heat for approximately 20 seconds until soft (time may vary so watch carefully as you do not want to melt the cheese). 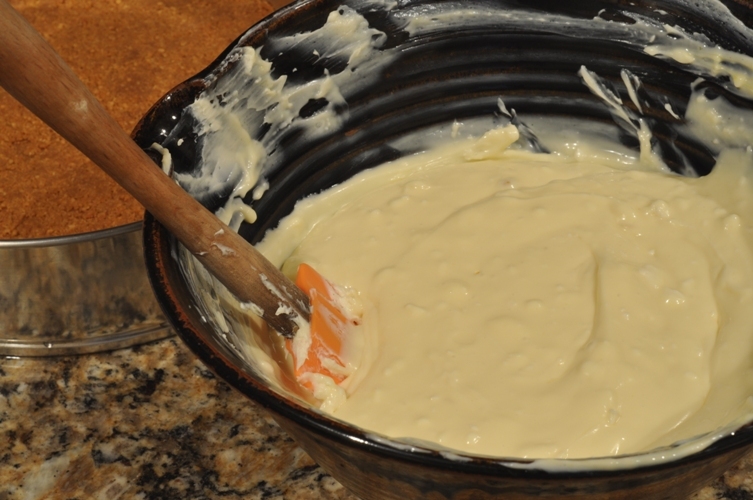 Add sugar and vanilla to softened cheese and stir well to combine. 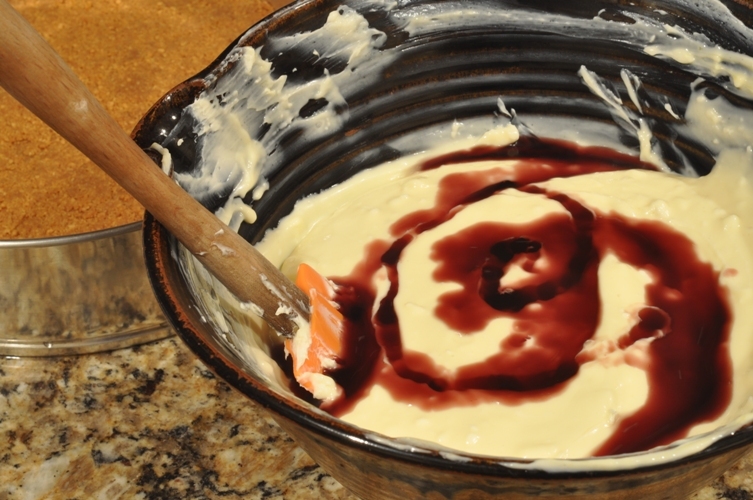 Add eggs to cream cheese mixture one at a time and mix until well combined. Pour in elderberry maple syrup and gently fold until syrup streaks the white mixture. Pour cream cheese mixture over graham cracker crust and place in the oven to bake for 40-50 minutes or until almost set. Test with knife by inserting it in the center. Allow to cool and set up for 3-4 hours before serving. Slice and serve. Sprinkle with fresh elderberries and drizzle with additional syrup. 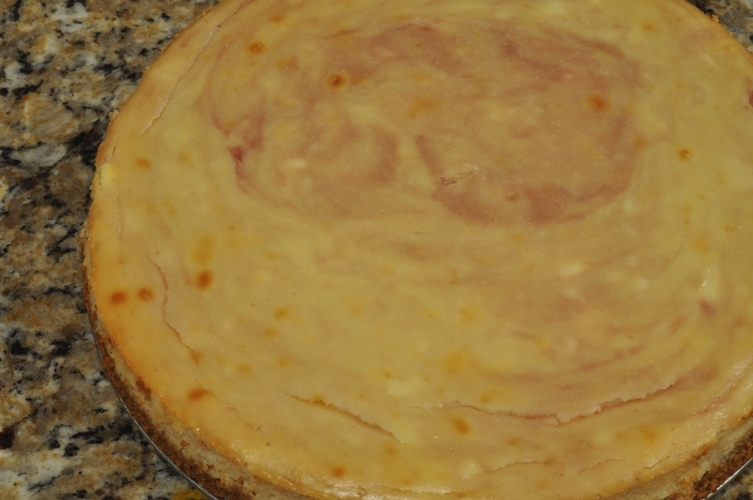 Consider experimenting with your next cheese cake by stirring in some maple syrup or adding some of your homemade preserves like strawberry jam or spiced blackberry jam. How do you alter simple recipes with your homemade preserves?